Over the past couple of days I've posted the Words to Say when you're warming up a prospective hostess, and following up with her the next day. One other piece of the business I wanted to share with you is what to say when you're making your customer service calls. 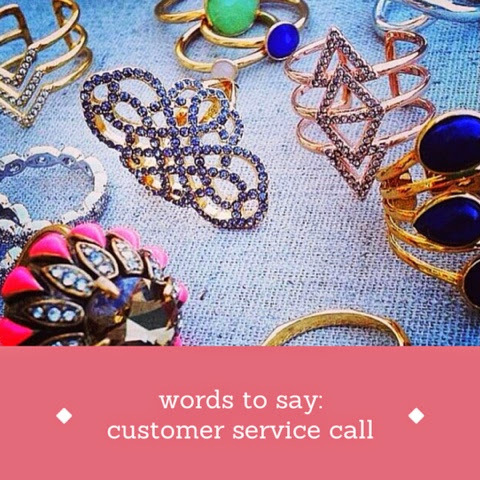 A customer service call is when you're contacting a trunk show a couple of weeks after their purchase. I highly recommend you do this for each and every one of your customers! They are in a prime position - they just purchased from you and very recently received their jewels/accessories in that super cute packaging, they remember your name and face and they're probably still excited from meeting you at the trunk show. This call will remind them again of your fun and friendly personality. (If she answers no) "I completely understand. I know you were also interested in some other accessories so why don’t we get your girlfriends together for a styling session and we can get you the rest of your wish list for free. Are Thursday nights or Saturday afternoons better for you? "I'm also collecting photos from customers wearing and carrying their Stella & Dot. Would you be willing to snap a pic of yourself for me to feature on my Facebook page? Great, thank you! I'll send you a quick email with the Facebook link - just reply back to that message with your photo." The stylist opportunity has never been bigger or better than it is now - it's irresponsible to NOT offer the opportunity to everyone you meet! Anyway, what's the worst that can happen? She says 'no'... but you planted a seed and you can move on with a graceful exit. She won't be offended that you asked - most of the time they'll be flattered that you think they would make a good stylist! After asking about the stylist opportunity, move on and suggest that she host her own trunk show. Note: I don't suggest that you try asking these in the opposite order (host a show, then become a stylist). There's a little bit of psychology behind why I progress from a big commitment to a smaller one. It's called the "door-in-the-face" technique. This method involves a persuader asking for something big. When the respondent says no, the persuader then asks for something smaller/more reasonable. The respondent is more likely to agree to the second, more reasonable request than if that same reasonable request had been made in isolation. Now, I'm not trying to trick anyone here! This is a simple sales technique that optimizes the way the human mind processes information. It works to my advantage in two ways. First, I'm increasing the likelihood of someone agreeing to hosting a trunk show (yay!) and second, I'm planting the sponsoring seed. We all know that stylists can make more money when they layer their income by sponsoring. So, go and try it! One last thing! The reason I wrap up the conversation with a short chat about my Facebook page is that I want to encourage my customers to feel comfortable emailing me, following along with my business on social media, and snapping and sharing photos of themselves in the S&D jewels. Not only do the accessories make them feel good, but by staying connected with me they'll associate those confident and positive feelings with the trunk show experience. It's a win-win! I want to know... do you call your customers after their purchase? What do you say?